LAMBERTS Pure Grade L-Lysine is an essential amino acid and is therefore one of the eight amino acids that our bodies can not make, so we are completely reliant on our diets to provide sufficient lysine. It is used by the body in a number of ways and, particularly in the formation of collagen, the most abundant protein in the body. An essential amino acid found mainly in meat and dairy foods. Intake maybe low levels for some vegans and vegetarians. Plays an important role in collagen formation. Works antagonistically to arginine to inhibit viral replication. Lysine increases the bioavailability of iron. 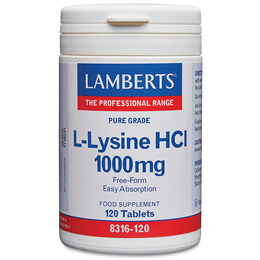 LAMBERTS uses a USP grade of L-Lysine, which is the quality used in clinical nutrition products. Some very cheap products are likely to contain animal feed-grade lysine as huge quantities are produced for agricultural use. L-Lysine Hydrochloride, Cellulose, Stearic Acid, Silicon Dioxide, Magnesium Stearate, Tablet Coating (hypromellose, glycerin). Take 1 to 2 tablets daily. It is preferable to take Amino Acids with fruit juice or water, rather than milk. An Amino Acid is best taken 1/2 hour before any meal or at bedtime. 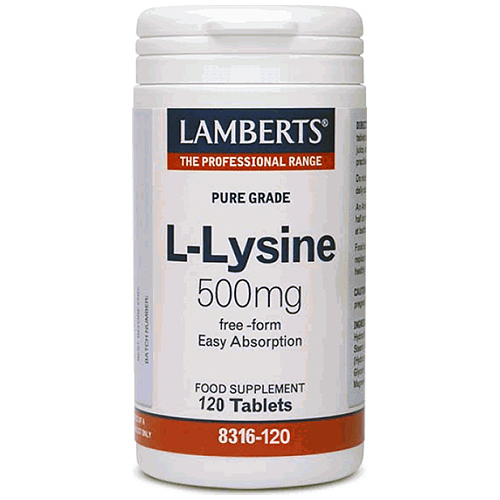 Below are reviews of LAMBERTS Pure Grade L-Lysine - 120 x 500mg Tablets by bodykind customers. If you have tried this product we'd love to hear what you think so please leave a review. LAMBERTS Pure Grade L-Lysine is an essential amino acid and is therefore one of the eight amino acids that our bodies can not make, so we are completely reliant on our diets to provide sufficient lysine.